You can always tell when early voting is in full swing by the amount of political mail stuffed inside the mailbox. My mailbox is no exception. It’s stuffed. Every few days, I receive one or two campaign mailers from Assemblywoman Francis Allen, who I mentioned on Monday. Allen’s campaign is struggling this election cycle after six years of credibility erosion. While I supported Allen during her initial run years ago, I am supporting one of her primary challengers this year. The campaign mailer I received yesterday reinforced this decision. The piece lacked credibility. Political lie detector or poorly disguised mud slinger? 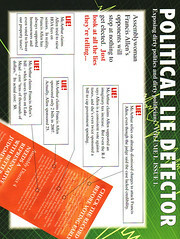 The mailer, entitled “Political Lie Detector,” is meant to resemble a rebuttal piece, which would normally point to errors contained in an opponent’s piece. Generally speaking, a truthful rebuttal is smart when time and money allow. However, when rebuttals strain to spin the story, it doesn’t work very well. Where does Francis Allen’s last minute rebuttal mailer go wrong? Allen says her opponent lied about her being charged with battery domestic violence because the case was dismissed. However, she was charged, the prosecutors are reportedly not letting it go, and her challenger never attacked her on that point. The missed opportunity? The rebuttal doesn’t claim innocence nor did Allen the last time she was asked. Allen said her opponent lied about her position on taxes, citing a newspaper editorial that says Allen was a reliable vote against taxes years ago. However, Allen has voted on bills that have allowed for tax and fee increases. Allen said her opponent lied about the number of bills she sponsored. It seems her challenger did not count resolutions, revisions, and bills that didn't represent her district. You can find them here. Allen said her challenger lied about the cost of a bill she sponsored. She said it cost taxpayers nothing. But what many legislators fail to tell voters is that every bill they sponsor costs time and money. Allen said her challenger lied about her sponsorship of a controversial homeowner’s association bill that would have allowed HOAs to raise fees every year without a vote by those paying HOA dues. But she did. Fortunately, the bill was vetoed. Allen then overreaches, claiming her opponents placed trashy literature on parishioners’ cars at her church. It seems unlikely to me that any of the opponents she is facing would do that. The risk vs. reward just isn’t there. In the very next sentence, she reinforces her pledge to run a clean campaign. However, the reality is that Allen has never been known to run a clean race. Most politicians ask voters to verify facts and Allen is no exception. So why would someone like Allen put out a piece that misses on every point? Although I do work on select political campaigns from time to time, this is one area of politics that never really sat well with me. But it is what it is. It seems that Allen is banking on two assumptions: that her challengers have not raised enough funds to correct these errors and that voters will not check the facts. Whether she is right on either point, I have no idea. We’ll know on August 12. Well its a good source of voting but rarely it works. It really depends on the piece. Whomever is running her campaign isn't doing a very good job at it. A so-called PAC did a mailing on her behalf, talking about how Francis Allen understands the local issues, where the PAC members live. The return address, however, is not from Las Vegas Assembly District 4, as it professes to be in the copy. The return address is 8 hours away — Reno, Nevada. One of the primary issues that residents are upset about is that Allen tends not to represent them, even though that is what she was elected to do.